Forging(Hada): Forging mark is based on Itame wooden grain, shows some Mokume burl ware indication. Hiraji surface is thickly covered with sparkling martensite glitter so called Ji-Nie consequently darkish Nie lines so called Chikei activity gushes out from steel. Hamon : Hamon is undulating Notare mixing with Gunome. There is rich Nie activity of which interior is covered in deep Nioi-mist and temper edge is thickly accumulated with sparkling Nie which is vividly bright. The interior of temper is filled with misty Nioi deeply that works with thick Nie lines so called Kinsen and Sunagashi activity. Temper of tip(Boshi) : Boshi blazes up so called Kaen shape of which tip indicates Sukagashi - sweep up Nie activity, small circle turns back deeply. Tang(Nakago) : Nakago is UBU in original. One peg hole. File mark is Sujikai slightly slanting left. Kurijiri (double bevelled) heel shape on bottom. The signature on Hakiura side is the 16 petals of Chrysanthemum crest, Seven characters that starts with an official district title Yamashiro-no-kami 山城守, the clan Fujiwara 藤原 then smith name KUNIKIYO 国清. Here is a prosperous work of the first generation of KUNIKIYO in Echizen-province in 1630's. His real name is SHIMADA KICHIUEMON 島田吉右衛門 who was born in Keicho 7, (1602) in Matsushiro-city, Shinshu. His initial smith name was SUKEMUNE 助宗 and had learned from great master KUNIHOIRO 国広 in Kyoto. After his master had passed away, he had come back to his home town Matsushiro to exclusively serve his feudal lord Matsudaira Tadamasa 松平忠昌 in Kawanakajima, Shinshu domain in Gen-na 2 (1616). He had moved to Takada town, Echigo in Gen-na 5 (1619) then again addressed to Kitano-sho, Fukui, Echizen domain to follow his lord Matsudaira Tadamasa in Kanei 1, (1624). In the 2nd month, Kanei 4 (1627), he changed his smith name from SUKEMUNE 助宗 to KUNIKIYO 国清 to obtain Yamashiro-daijo title from the Imperial Court then upgraded to Yamashito-no-kami title in the following year Kanei 5 (1628). He also was officially allowed to chisel the official Imperial Seal of Japan 16 petals of chrysanthemum flower crest 菊紋. This is for him to compete with his rival YASUTSUGU 康継 who obtained Aoi crest 葵紋 from TOKUGAWA Shogunate. Passed away Kanbun 5 (1665), buried at Seien-ji temple 清圓寺. The shape of this wakizashi is quite rare, splendid Kiri-ha-zukuri construction which had come into vogue during Momoyama period. Width is wide and curvature is shallow leading to wide upper Fukura area in full in decent shape. Temper shows Nie-based Notare mixing with Gunome and the interior is splendidly active with rich Nie activity such as streaming Sunagashi, Kinsuji and Ni-ju-ha which is vivid and bright. From those major character of carvings of this article - Bonji on groove and deep in carving, this is understood that KUNIKIYO made this Wakizashi under strong influence by the ancient top article of SADAMUNE 貞宗. This wakizashi is the good example of 1 st smith KUNIKIYO that shows his skill is supreme not only Yamashiro school but also even better in Soshu technique. 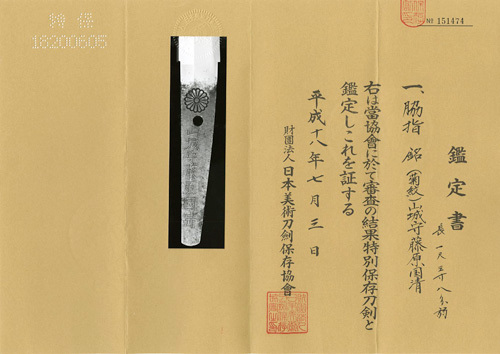 Among similar works, this blade gives off the great delight and had been transmitted by the Samurais in generations throughout Edo period and treasured by enthusiastic collectors in modern times. Gold foiled habaki collar. Comes in Shira-Saya plain wood mounting. An old good polish/Condition scale: very good (using a scale of mint-excellent-very good-good-fair-poor).